"Si's writing is flawless, witty and very engaging." "... what an absolute pleasure it was to read this book... it was well plotted, full of humour, romance and mystery..."
"... a great mix of characters, humour, adventure and an interesting twister of a plot, I think this would make a great TV mystery drama series." Over 125 FIVE STAR reviews on Amazon! 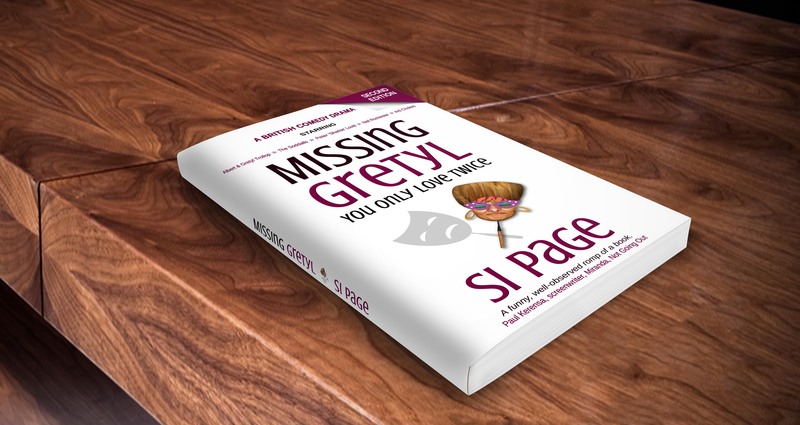 Si Page is the author of the highly rated comedy drama ‘Missing Gretyl’, a satirical parody called, ‘The Inside Scoop: The Secret Journal of a Prime Minister,’ and The ‘Book Club Charlie Award 2016’ comedy winner, No Idea. Thoughts from Si over half a cup of tea and a packet of crisps (or two). All the thoughts are his own – apart from the ones planted by someone else. Read a sample of reviews taken from Amazon, Goodreads, blogs and some jolly nice people working in TV and Publishing. Wrote to an agent and said that I sold 2 million books last year. They didn’t believe me. What were they expecting? I’m a fiction writer. My new book is called, ‘How To Cure Obsessive Compulsive Disorder’. It’s so good, you’ll want to read it over and over again. Some seriously BIG names have been following me on Twitter lately. One of them was 42 consonants and 17 vowels long. Missing Gretyl – Get ready for a fun ride with holiday scams, flying toenails, botched hairdos, crazy car boots, cocaine-filled taxis, a deluded hitman, arson and murder. At the heart of the story, is a mysterious letter that threatens to turn the world of Albert & Gretyl Trollop upside down. See it here on Amazon. Si Page has three books currently in development. The first is called ‘No Idea’ about a failed writer who shares a bedsit with three dossers and a girl called Pit Bull. It is a comedy drama. Click on the NEWS Tab on the top menu for more information. The second book is the sequel to Missing Gretyl and the third is a story called ‘The Collar’. Watch this space!